High-quality enamel cookware will never go out of style, and every chef falls in love with them, because meals are better cooked in them. No teflon or ceramic pot will replace the old enamel pots! The only inconvenient enamel pots have is those ugly stains they catch after tons of meals cooked. These stains appear if you burn food, grease, or sauces. Enameled pots last for decades, because my grandma cooks in the same pots since I was little, and they still look impeccable. Her secret to maintain the enamel pots in a good condition? Well, I will reveal it in the lines below. Whether they are made of cast iron or metal, the enamel cookware mustn’t be washed in the dishwasher nor using abrasive sponges or powders. Fill the tub or sink with hot water, and half a cup of dish soap with half a cup of baking soda, and let the pots and pans to soak in there for 1 hour. After the time has passed, use a dish brush or a sponge to clean the remaining grease stains. 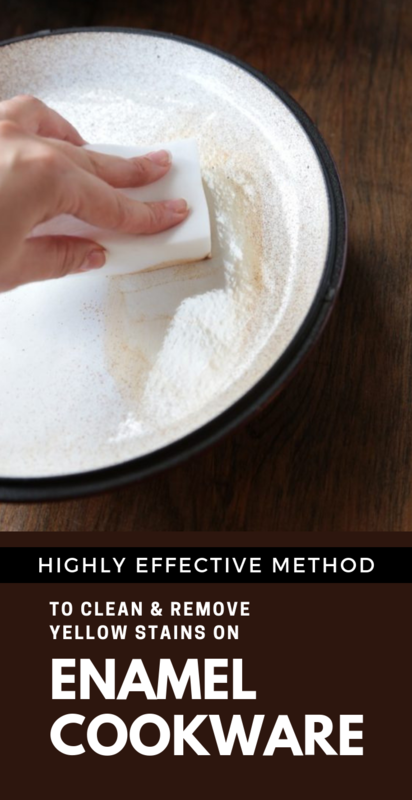 You will see how these grease stains will easily be removed from the pot without any effort. How to whiten enamel pots? Mix these 2 ingredients and apply the solution all over the interior of the enamel pot. Let it work for 20 minutes. Rinse, and then wash with dish soap.